The former landscaper now grows the popularity of the train experience. 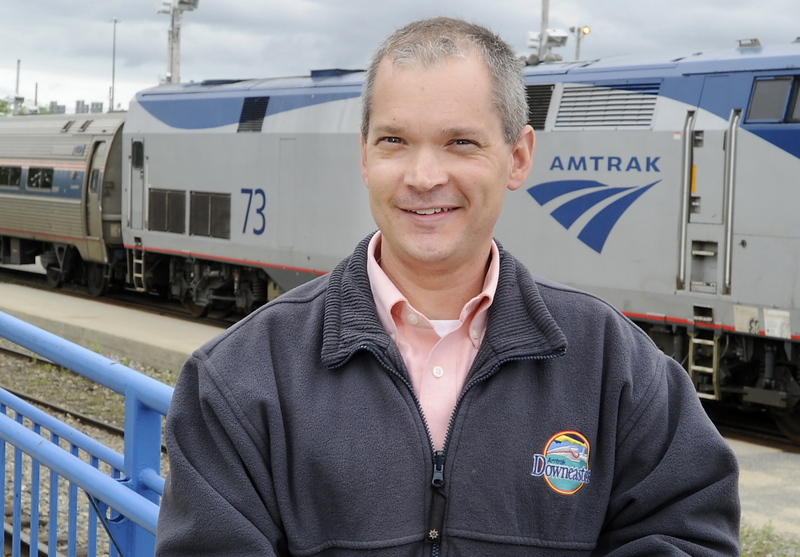 Brian Beeler II is the manager of passenger services for the Northern New England Passenger Rail Authority, aka, the Downeaster. This means he hears the laments (and praise) from regular passengers. About 30 percent of the Downeaster’s customers use monthly passes to commute, mostly to Boston. Just after the news that ridership on the train is down, due to delays in much-needed work on the tracks – rough winter for everyone – we called Beeler up to talk about commuting via rail and how a guy with a degree in landscape horticulture from the University of Maine ended up riding the rails. His father died before Beeler landed the job with the rail authority, but “he would have been ecstatic.” But they did ride the Downeaster together, to see the Red Sox, when Beeler was still a civilian. CONDUCTING COMPLAINTS: Beeler is one of just six full-time employees working with the Downeaster, so his role is broad. But “my primary role is once the customer has purchased their ticket, from that point until they get off the train is my responsibility,” he said. That means fielding complaints about everything from weak coffee to the schedule. Despite many delays of late, it’s not all grumbling. “I receive my fair share of complaints and compliments,” Beeler said. FULL SERVICE: Part of his duties involve riding the train (no conductor’s hat, just a polo with the Downeaster logo on it) to talk directly to passengers, or to keep an eye out for the school groups that regularly take the train on field trips. TRAVEL TIPS: While nearly a third of the Downeaster’s ridership is made up of commuters (including some University of New Hampshire professors who commute from Portland to Durham), many ride the train as tourists. “You can drive to Boston faster and cheaper,” Beeler said. BEYOND BOSTON: You’d be surprised about the number of other good destinations on the Downeaster’s line, Beeler said. “If you have kids, Dover has got a really great kids’ museum, right downtown, and great places to eat.” Then there is Haverhill; a downtown revitalization project has yielded “tremendous” results, he said.